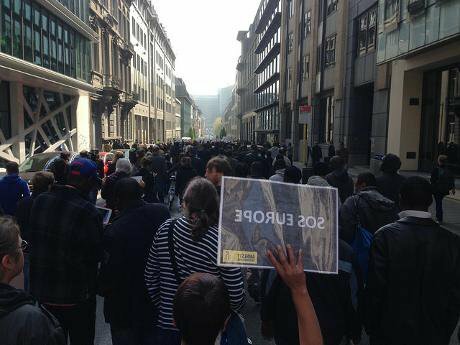 Sea of humanity: supporters of Amnesty International and other NGOs marching in Brussels as the EU summiteers met. Flickr / Amnesty International. All rights reserved. This week an EU-wide control operation to detect, detain and possibly deport irregular migrants has been taking place. Operation ‘Amberlight’ is a collaborative effort between the EU border-control agency Frontex and national police forces, aimed at collecting information and checking third-country nationals’ legal status. Non-European, undocumented migrants are the main target of these controls. Simultaneously, the worst tragedy yet has occurred in the Mediterranean, with more migrant deaths in the last week than in the whole of 2013—to which the EU’s response is a minimal commitment to expand search-and-rescue operations and mount more border controls. These two parallel occurrences sum up the EU’s current approach to migration: securitisation at all costs, even if it means thousands of human beings, fleeing war and desperation, dying. During the last similar operation, ‘Mos Maiorum’, in October 2014, more than 19,000 irregular migrants were intercepted but very little was officially reported on the protection of migrants’ fundamental rights. At the time, local activists and civil-society organisations denounced the risk of arbitrary detentions, poor living conditions in detention and worrying complaints of racial profiling. Indeed, many people reported they had been ‘stopped and searched’, based on the colour of their skin. Targeting people because they fit a particular stereotype leads to racist practices, especially when police forces use European institutions’ decisions as an instrument for discrimination. Even if over the last three years such operations have become an established tradition, this is the first time that the Council of the European Union has allowed Frontex to also monitor sanctions imposed by the EU directive defining the ‘facilitation of illegal immigration’. It is not yet clear if the penalties will be applied only to migrants or also to those—abusive employers—exploiting their irregular status. It is no coincidence that Amberlight has been taking place at the same time as the tragedies in the Mediterranean. With the ‘Fortress Europe’ approach of the EU’s migration agenda, it does not matter if someone is fleeing a country to demand international protection or is seeking a new home in a member state: current policies aim to ensure any kind of migrant is shown the borders’ exit door. Europe is locked. Securitisation measures will not solve the structural issues linked to migration and asylum. In the context of Mos Maiorum alone, some 11,000 of those intercepted requested asylum then or later. People in need will always find alternative routes to reach international protection. The reinforcement of border controls and operations co-ordinated by Frontex do not put human rights and dignity at the heart of potential solutions. In recent days, more than 1,000 people drowned in the Mediterranean but even when someone is fortunate enough to enter the EU and to request asylum or a residence status on European soil, the administrative procedures are challenging and leave many applicants in despair. Two weeks ago, Belgium witnessed the suicide of two asylum-seekers who could no longer stand the long and severe residence application standards and the lack of a real, supportive integration system. And the Dutch Central Agency for the Reception of Asylum-Seekers reported that 13 asylum-seekers committed suicide in just the first half of 2014. Such control operations continue to fight an imaginary threat. Migrants and asylum-seekers should be treated as victims, not criminals. The ten-point action plan on migration released last Monday by the joint EU Foreign and Home Affairs Council and the four priority areas for action agreed by EU leaders at the special European summit on Thursday only confirm the EU’s real intention: maintaining border surveillance through naval missions (which can again lead to push-backs at sea or at any other border), rather than putting forward concrete solutions for a collapsing migration system. The EU’s minimalist approach (huge means and resources to declare a war on smugglers rather than focusing on saving lives) does not address the urgency of responding to migration challenges. Keeping people beyond Europe’s borders will push them to flee through other potential dangerous routes. The Mediterranean crisis is also being exploited to put back on the table two policies which do not respect a fundamental rights approach. The first is fingerprinting of migrants and asylum-seekers. Many organisations have already reported the use of coercive measures in the collection of migrants’ digital fingerprints. The EU should ensure that this practice is undertaken without use of violence or physical force and in full respect of data-protection standards. The second is forced returns. This is controversial and recent assessments confirm that many fundamental rights issues are not properly addressed: inhumane detention conditions, the mechanisms of entry bans (if the migrant wants to return to Europe) and how these third-country nationals are to be reintegrated into their home country. By implementing this return policy, the EU is closing its eyes to the fact that most asylum-seekers are not on the move for economic reasons but because they are fleeing regions where they face war and oppression. EU institutions should not only improve measures for safe and legal avenues for migrants and asylum-seekers but should also provide clear guidelines for sharing responsibility for asylum-seekers among the member states. From a human-rights perspective, the EU should also better oversee the work of Frontex. A mechanism enabling individual complaints of violations of fundamental rights would demonstrate the will to improve the agency’s accountability. The new European Migration Agenda, due to be presented in May, is an opportunity for the EU to finally act upon its values and commitment to fundamental rights. Let’s hope it won’t miss the boat this time around.